Book 3-3- Part 4 of Living in the Bonus Round: Theatre Camp! The first draft of the new poster for DCT designed by Bob Green. I said, 'I don't need to see it. When would you like to open?'" Opening weekend is now over. I'm comfortably sitting on a couch in a nice apartment just outside of Rochester, NY. Jimmy is asleep on the floor. The TV is playing some documentary about Hollywood. I've already run our errands, picked up mail & groceries, checked in with Chris, and all is well except for the fact that I miss having Thurber curled up in front of me. I miss Steinbeck trying to walk on my computer keyboard, fighting for lap space. "I liked this better than The Last Session." April works in the office and is married to Dan. There's no way I can convey in words how warm and inviting the faces in Rochester are. I'm seeing faces I know. Faces I kinda know. Faces I want to know. And all of it without my glasses so it's all kinda one big blur. That picture at the top of this diary was taken this past week and they, responding to my request, "adjusted" my right eye to match the left. In real life, my right eye is somewhat paralyzed and it tends to point up (leading the LA Times reviewer to describe them as "fathomless"). If you want to see my googly eye, you'll have to see it in person. I hate the way it looks in photographs so I "fix" it whenever I can. But somehow, with this project, where Jimmy and I open ourselves so wide open emotionally, it just feels right to take off the hardware and expose myself. On opening night, I suddenly realized I had forgotten my black show socks. at the other theatre, DCT 1. And yes I know I have skinny legs. Shut up. Wow, what a fantastic night we had seeing your opening night of BIG VOICE. We are still talking about your genius wordsmanship giving us so much to think and talk about. The brilliant part was how you kept us laughing while you while you made us angry, sad, excited, confused, and proud. The world is truly a better place because of the two of you. We are so glad we have gotten to know you, Steve, and that you now also bring Jim into our lives. Over alumni lunch on Saturday we were talking about seeing you in Dallas for The Last Session, and one of the women at the table said something to the effect that we COULDN'T have seen you, because you had died! We assured her that you were, in fact, still alive and that we did see you, but it was like she really didn't believe us, and kept asking if we were really sure it was you, and did we actually talk to you! Anyway, I felt like we needed to make a big banner --STEVE IS ALIVE!!! to hang on the gym wall during the ballgame. The gym wall! I like that! Thank you, Nancy, and I think you just gave me the name of the next book of this diary. Speaking of dead, Jimmy got up from the floor just now and went back to the bed. Little feller has had a tough week. Speaking of the cats, I dreamed about them Saturday night. I dreamed I was in L.A. talking to a pharmacist, asking some kind of technical question. Outside, on the curb was my motorcycle. On the motorcycle Thurber was curled up very contentedly waiting for me. I got out to the motorcycle and a policeman had given me a parking ticket. I begged him to let me off the hook but he was adamant and gave me a ticket. As I got back on the bike and was driving home, I suddenly was holding both cats in a position we have dubbed, "An Armful of Cats" -- where they are draped over my arms, facing out. And when I held them that way, though I wasn't touching the steering wheel, the bike went where it was supposed to go. First of all, motorcycles terrify me. I do not own, nor will I ever own, a motorcyle. I had a terrible moped accident in Bermuda back when I was a ship singer. It took the skin off my entire left arm and it took months of careful doctoring to get it back. (I do, however, look really good in a motorcycle jacket). These icicles are on the building across from us. This is looking out our window. This past Saturday, we took a ride out into the country to find the mythical "Pittsford Wegman's." A mega-size grocery store that's spoken of only in whispers. I read this sign trying to imagine who would WANT to stop on railroad tracks. Jim finds jellied chocolate things at the Pittsford Webman's. As soon as he saw the "towers of candy," that was it for him. This is our pal, Bud. He is one of the co-producers of the Rochester "Big Voice." Bud took us to dinner last Monday night. Outside the theatre during opening weekend. It wasn't that cold. In fact, it got up into the 30s. I'm already acclimated to where that sounds positively balmy. These are the volunteer ushers for the evening. 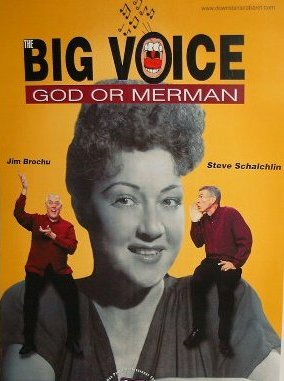 They kept asking us, "What does Ethel Merman have to do with this?" And I kept saying, "That's why we have a musical. It will explain all." Sunday morning, I was the guest speaker at the "Above 50" Sunday School class at a United Methodist Church here in Rochester. Jimmy said I was very "inspirational." Then that afternoon, we held an audience talkback where Jimmy charmed them to pieces with his stories about his close encounters with people such as Joan Crawford, Lucille Ball, and Gloria Swanson at the Player's club. Okay, I have to tell the story of the embarrasing moment. It began when Jimmy noticed, that with my microphone pack strapped to my back, my shirt kept falling out of the back of my pants. He suggested I tuck the shirt into my underwear so they'd be more secure. So Saturday night, I put on the mic pack with wire leading up the front of my shirt and tucked the tail of my shirt into my skivvies. Well, let's just put it this way. For a couple of moments there, The Big Voice had suddenly added a new character, a marionette! a 50s a nightclub act Jimmy has labeled "Gaze Over Broadway". that well with the 50s audience.